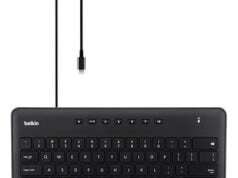 Belkin is trying very hard to compete with its competitors on the market for iPad-compatible wireless keyboards. The current situation is that for around $100 you can get an amazing wireless keyboard, that’s solidly built and offers great functionality, which means that manufacturers are giving their best to offer something that will make their products stand out above the rest. When it comes to Belkin, by reviewing some of their latest products it has become clear that their build quality is getting noticeably better, and they are also stepping up in terms of design. Belkin’s Qode Thin Type Keyboard Case ($100) is the latest product in an effort to win over the market of wireless keyboards. Even though Belkin is saying that this product is a case, this is more of a lid with a keyboard that only protects the iPad’s screen. 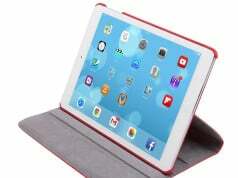 On a first look I was very happy with its build quality, since the keyboard feels very solid and sturdy, and it is also easy to connect it to the iPad Air. You can choose from white or grey editions, and it ships with a Micro-USB cable. 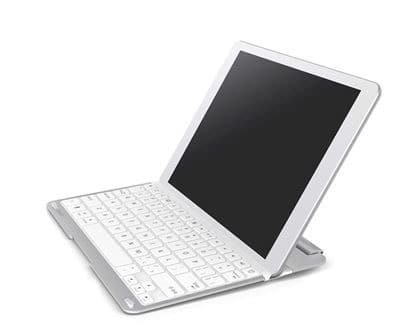 The Qode Thin Type Keyboard Case magnetically attaches to the front side of the tablet, pretty much like the Apple’s Smart Cover. 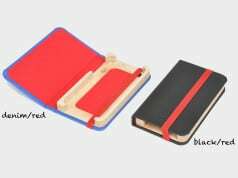 There is a subtle rubber layer on the edges, which is very gentle to your iPad, so you don’t have to worry about scratching the screen. 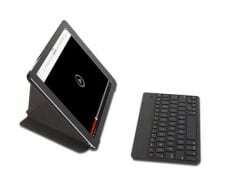 In order to use the keyboard with your tablet you will need to pair these two. However, this needs to be done only once. 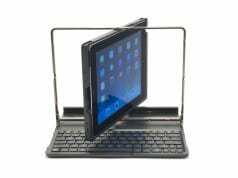 Every time you place the tablet into a metal ridge right about the keyboard part, you will push down a button that will activate this device and wake up the iPad’s screen. Belkin has done a great effort to preserve the battery life, which can last up to 79 hours of active use, which seems like a great result. On the other hand, it offers about six months of standby time. 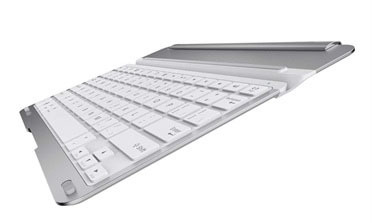 Speaking of design and performance, it seems that this keyboard was heavily influenced by Apple’s own keyboard. There is a subtly textured finish that feels very pleasant while typing and the keys are very comfortable to use. If you never used an iPad keyboard, you will need to spend some time practicing since every iPad keyboard comes with its own specific layout. Belkin has done a good job of creating the most effortless layout, which feels very natural and easy to get used to. What’s interesting to mention is that the keyboard brings a couple of iTunes Radio keys, which replicate functions like “Play More like This”, “Never Play This Song”, and “Add to iTunes Wish List”. If you like listening to iTunes Radio, you will love this feature. There is nothing negative to say about this product. It is quality made, easy to connect and use, and offers nicely designed keyboard. It all comes with a great price of $100 which, at the moment, does seem like a very good deal. PROS: Quality made. Effortless Bluetooth connectivity. Great keyboard layout.